Composer Erin Murray Quinlan (left) and author Larry Ruttman at a reading of “Jews on First’’ at Temple Shalom in Newton. NEWTON — They’re separated by nearly three generations and a world of cultural signposts. She’s in her 20s, he’s in his 80s. He’s an intermittently observant Jew from Brookline, she’s an Irish girl raised in a Congregational church in Connecticut. He’s been a Red Sox diehard since the old Boston Braves left town in 1953. She grew up going to Yankees games. 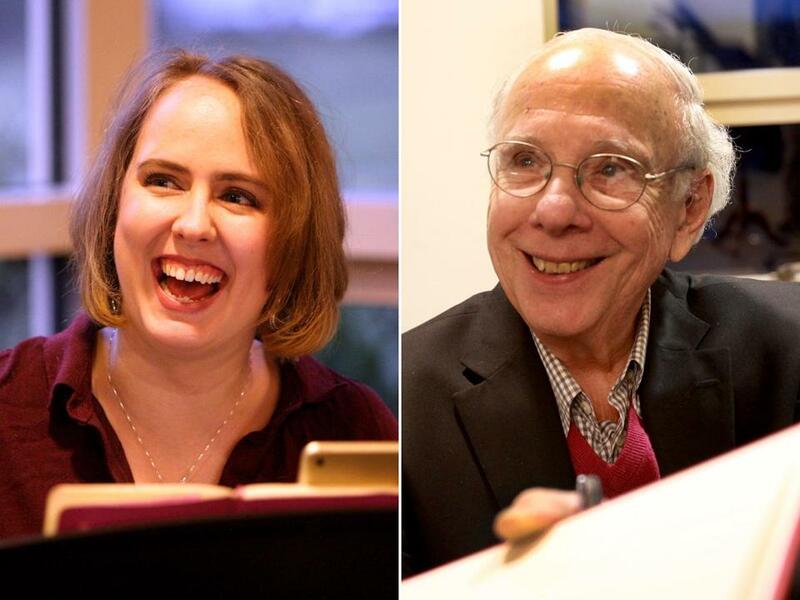 Yet for all their differences, it was an instant friendship for Erin Murray Quinlan and Larry Ruttman, beginning the moment he stole her seat at Symphony Hall. They joked about it — Quinlan smiles freely, and Ruttman is a world-class kibitzer — and then they began an e-mail correspondence that has lasted nearly eight years. Now their friendship has produced a creative work that combines their individual strengths with the one thing they truly have in common — their mutual love of theater. Ruttman, a lawyer and armchair historian, published a hefty book three years ago called “American Jews & America’s Game,” tracing the intersection of his heritage and his favorite sport. When he hit upon the unusual idea to adapt the book into a stage musical, he called on Quinlan. She’s a Berklee College of Music graduate making her way as a musical theater composer. Would she be interested in collaborating? At first she thought it sounded like a strange idea, as have most of the people Ruttman has pitched. Then she started thinking: Andrew Lloyd Webber created a tribe of singing cats cavorting on a giant tire, and a bunch of train engines brought to life by actors on roller skates. “There have been weirder ideas” than Ruttman’s, she said recently at Newton’s Temple Shalom, where she was preparing for a workshop performance of “Jews on First.” The show had its world premiere Monday at the American Jewish Historical Society in New York. Co-written by Larry Tish and Lee Goodwin, “Jews on First” tells the story of a grandfather who helps his teenage grandson learn a few life lessons through stories of the great Jewish ballplayers, such as Hank Greenberg and Sandy Koufax. Boston stage veteran Ken Baltin, who played Willy Loman in “Death of a Salesman” at the Lyric Stage Company in 2014, takes on the role of Grandpa. Newcomer Eliott Purcell portrays Aaron, the grandson who wants to play baseball and isn’t sure what to make of his heritage. Tish earned a Boston Playwrights’ Theatre fellowship in 2014 for his play “The Last Jews: An Apocalyptic Comedy,” and he premiered “The Black-Jew Dialogues,” co-created with Ron Jones, at the Edinburgh Fringe Festival in 2006. “There’s pretty much ‘Jew’ in every title,” he joked about his resume. These days, she’s spending time in New York City as well as in London. Still, she likes the pace of Boston, where she lives with her husband of five years. She’s been attending shows on Broadway since she was a kid (Rodgers and Hammerstein were an early favorite; she first saw “The King and I” at an impressionable age), and she’s been writing her own shows since she was in middle school. For Quinlan, making a career in musical theater has always seemed inevitable. “It’s never been a decision,” she said. There’s that old trope in classic musicals, in which the characters are so overwhelmed with emotion that they just have to bust out in song. To Quinlan, there’s nothing hokey about it. “That’s the world I want to live in,” she said. Before the audience began to arrive, Baltin and Purcell arranged their music stands at the front of the room, a meeting space inside the temple. With Quinlan seated at an upright piano to their left, they ran through a few of the show’s songs, picking their way through some of the trickier passages. If Quinlan wasn’t sure what a mensch was before she began working on the show, she knows now. “Her star is rising,” said Ruttman with a hint of grandfatherly pride, before taking a seat in the back row.